Low expectations can go a long way to improving how you view a film. They also have the alternate effect, but for Hunger Games, I was definitely thinking that it was going to be a soft, teen-aimed, love-affair set in the background of a Battle Royale rip-off. I couldn’t have been more wrong and this meant I was very pleasantly surprised by the movie. It wasn’t the fantastical Harry Potter or the love-struck Twilight that I was expecting. Instead you have mature, violent, well-paced and extensive story with a great cast and brilliant performances. The first surprise I got was with the story. When I was hearing the hype surrounding the film and the source book’s popularity, I couldn’t help thinking it was going to be a teen-friendly Battle Royale rip-off. I like Battle Royale, it has a good story, a very interesting look at how people would act to survive and is a very well-made movie. Hunger Games manages to take the central idea presented in Battle Royale one-step further though. The actual battle and the way the teens survive is the at the center of Battle Royale, for Hunger Games, we also get the preparation for the event too. I was expecting a Battle Royale rip-off but was pleasantly surprised. This adds a well-needed and very interesting layer to the story. The actual hype surrounding The Hunger Games and how these reluctant combatants, mixed with actual volunteers for the gory event, prepare for the Games themselves. We get introduced to the Olympic Opening Ceremony type event, the mentors and previous contestants and the trials and tests they have to complete before they start killing each other. We also get a fantastic mix of characters that is missing in the movie’s Japanese cousin. Not just our two central characters, but the other contestants they are pitted against. It’s not just crazy kids killing each other. We have a small girl who is adept at climbing trees, as well as a super-brute, all-american Jock who is far too prepared for the games. It fleshes out the film even more and adds more depth without making the movie complicated. Of course, a movie’s characters are only as good as the cast that are playing them. 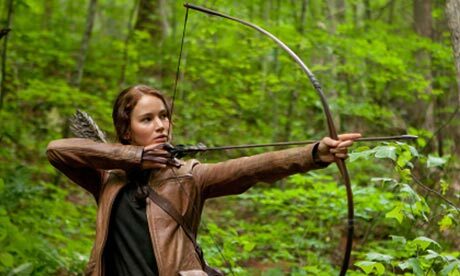 Hunger Games benefits from an excellent cast, mixing the movie veterans with the untested, fresh, younger actors. Jennifer Lawrence was relatively unknown but since the Hunger Games, she has catapulted into the spotlight, with X-Men:First Class helping her along and her recognition becoming concrete with a Best Actress Oscar. Her performance here demonstrates the skill that got her that Oscar, with a fine balancing act between action hero and vulnerable heroine. Jennifer Lawrence’s performance demonstrates why she has blown-up in popularity in the past year. It’s not just a one woman show though and it would be quite easy to relegate Josh Hutcherson’s Peeta Mellark to supporting character. He holds his own, through a great performance which counter-balances Lawrence’s Katniss, as well as a very well-written story of his own. Surrounding our two central characters are a whole host of colourful and interesting supporting cast. From Woody Harrelson’s survivor of a previous games to Stanley Tucci’s television host, each character is designed to highlight the reality tv aspect of the Hunger Games and how absurd the experience has become. This also highlights one negative aspect of the movie which is the lack of history to the Games and situation. It feels like this is lost in the transition between book and movie. I have never read the book but I feel like I want to know how we came to this very unique and interesting situation. Things are hinted at, a revolution is mentioned throughout the movie, but maybe a little bit more time spent fleshing out this aspect of the story would help give it more grounding. The colourful, supporting characters help flesh-out the movie further. 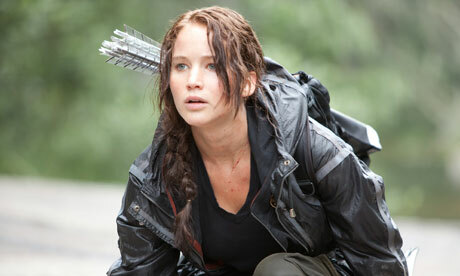 Overall, The Hunger Games surprised me and has become one of the best films I’ve watched this year. It wasn’t the kid-friendly, Battle Royale rip-off that I was expecting. Instead it was a well-paced, exciting and interesting story which didn’t hold back. Add to that some great characters, played by fantastic actors, and you have a movie franchise that could be as good as, if not better, than the wizards and vampires that came before it. This has now become a sequel I’m actually looking forward too. 9.8! What?! I disagree, but I don’t want to argue. Really?! Yeah, really really enjoyed it! Thought the story was great, performances were really good and was just very surprised and entertained by the whole thing. An excellent film. Would you be a lot lower? Me either, thought it might have swayed your opinion of the film.